The only zoo in the country located at a high school, Trevor Zoo is the perfect place to get to know close to 200 different animals, including lemurs, alpacas, chinchillas, wallabies, otters, and more! Large enough to house eight endangered species but small enough to comfortably walk the whole space in an afternoon, Trevor Zoo will satisfy avid animal lovers and casually curious young minds alike. To get a sneak peek of what you’ll see at the zoo, check out the livestreams of the blue herons and red pandas on the zoo’s website. 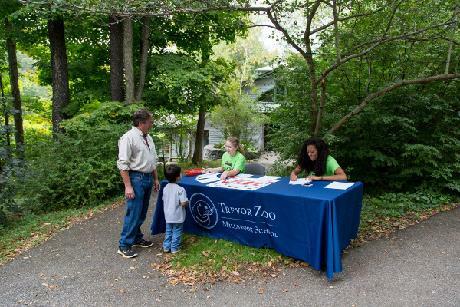 You can even chat with zoo staff to ask them your burning questions! Comfortable shoes. The zoo sits on six acres, so you won’t have to do a ton of walking, but you’ll want to make sure your feet don’t hurt while you’re hanging with the critters. Sunscreen. Hudson Valley summers can be hot, hot, hot – make sure to protect your skin! Paper and a pen. There’s lots to learn about the animals, from where they come from and what they eat to whether they are endangered and how they take care of another. Be sure to write it all down (or even draw pictures!) so you don’t forget. Math: Before you go, make a list of all the animals you might find at the zoo. Then go on an “animal scavenger hunt” and keep track of how many you can find. Younger kids can use subtraction to figure out how many animals are left on the list. Older kids can figure out the number of animals on the list you did and didn’t see using fractions or percentages. Science: As you approach each exhibit, have your kids try to guess what types of food each animal eats based on the environment they live in. Then check with zoo staff to see whether they were right – and when the next feeding time is! Once you’re home, sit down with your kids and talk about the things you and your family can do to help protect the earth and the wildlife you just spent the day visiting. The list might include ideas like walking to the grocery store instead of driving, carpooling more to school and soccer practice, purchasing reusable shopping bags, using a clothes line or drying rack, planting a tree, or writing letters to local lawmakers.